I recently got myself into GP Bikes VR. The potential is huge however I would like to make a request. Would it be possible to have a parameter allowing us to set the camera into an "absolute" position. The head movements would be in control of the cameras at all times. When I'm using a VR heaset (seated on a chair) and I brake in GPB, the camera is moving as my head would do in real life even though my head didn't move because I am comfortably sitting. In this case, I would like the camera to follow my non-motion and stay "fixed". It should be pretty much the same for turns. I would like to use this parameter in a motion simulator. There are 3 views you can use, one of them is fixed and does not move as you describe, did you find this? There is still rider movement along with the bike leaning and pitching but no rider movement due to that momentum or your leans inputs. I will check more in detail then. Thank you. The pictures will come shortly. I think I know what Gibbon means, when the bike leans into the corner the camera perspective stays horizontal instead of leaning with the bike. I would really like to try a perspective that is locked to the bike and leans with it so the in-game bike and handlebar doesn't move away to the side and stays centered. I tried some things in the files already with mode=1, tried different settings in-game and all perspectives but I couldn't get such a perspective. I would like to make a Mixed Reality video at some point but for this I need a static perspective where only the head motion I do changes the perspective relative to the bike. Also it's quite hard to recognize how far the bike is leaning already when you are looking ahead the road because the camera stays the same all the time and also the bike is moving out of the perspective. To be honest I was inspired by your Mixed Reality videos on Youtube with car simulation, they are great. I have no idea if such a "view" is a lot of work for PiBoSo. I hope not. Here is a little sketch I made. It's intended to represent what should be the camera position according to riding phase if the player is not moving. In grey is the virtual rider. Hypothesis 1: The player is seated on a chair. Straight line -> the view is fixed. If the player doesn't move, the camera doesn't move. Leaning backward/forward requires an action from the player. I don't have enough experience with VR and/or my custom controller to be sure of the good option. At first sight, I would say B or E.
Leaning backward/forward requires a action from the player. The player has full control of the camera at all time. The default camera position for the second onboard view is "Option B". Ultimately, After doing some tests, I think the best solution (for my application) will probably be solution E.
But for now the main issue I have is the VR user view being "overwritten" by the virtual rider view. Now, the VR camera follows the red line. I would be glad to have the possibility to use the green line with the Oculus. The second onboard view should be fixed to the bike. But the point of the bike on which the camera is fixed is also in motion relative to the ground. What I mean is that the "reference point" for the camera should be to a fixed distance to the ground. For example a good reference point could be the point of contact between the front tire and the ground as mentioned on the sketch. Then it would only be an issue during wheeling. 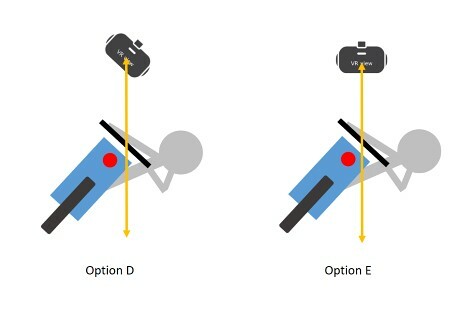 To select the "alternative" mode for the onboard views ( pointing to the direction of motion and pitch relative to the ground rather than the bike ). My bad. I didn't think to check this documentation. For VR users (experiencing motion sickness or not) I highly recommend this parameter. It is really a game changer for me. My only request now concerns the Option E camera. a TrackIR before I got VR it just seems more natural. For me, options C, D and E are unrealistic, and nauseating, as when I lean a bike, even without leaning my body, my entire body tilts with the bike not staying virtical.